For no particular reason my mind wandered toward Italian gelato earlier this week, (not an abnormal occurrence in Shannon-land) and as I sat there day-dreaming pangs of nostalgia for Italian ice-cream surfaced and I thought, you know what, I need take this gelato love-fest out of my head and share it with you. A case full of pretty gelato flavors in Florence, Italy are all marked and ready to be bought or sampled! So without further ado, let’s journey through a wee bit of a gelato montage with some Italy and ice-cream facts interspersed for good measure (and if you’ve ever seen the highly inappropriate movie Team America then you can sing the montage song in your head too…which is what I was doing when I wrote this post). 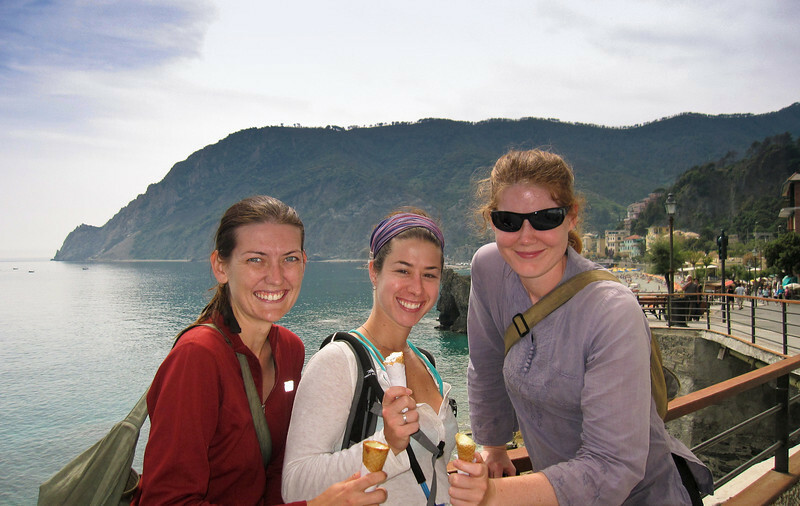 A well deserved pit-stop in Vernazza for gelato after several hours hiking through Cinque Terre, Italy. 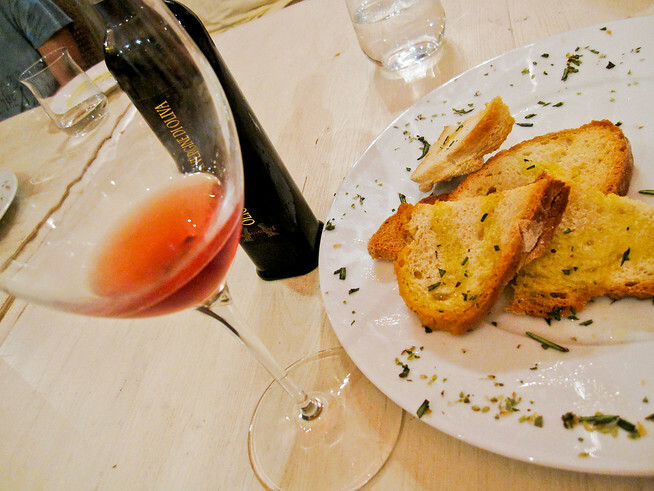 Wine, bread, and fresh olive oil on a wine tasting in Florence, Italy. Meals in the country are filled with fresh pastas, fragrant sauces, garnished with lightly steamed vegetables retaining just the perfect amount of crunch. Then you compliment your delicious meal with a sweet and fruity local wine shipped in from the countryside not more than 50 miles from where you sit and it’s memorable. Even years later it’s memorable. 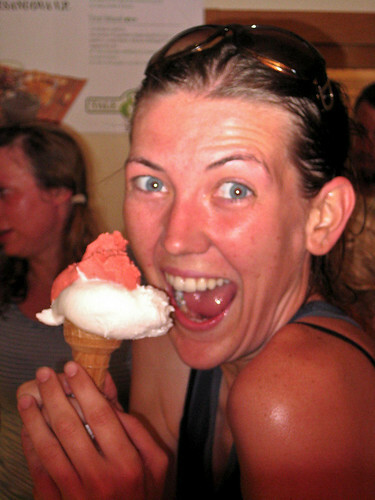 Not sure I could be any more excited than this for a cone of gelato after a long bike ride in Tuscany, Italy. Presentation is all a part of the eating experience and I can’t decide if part of why gelato tastes better than American ice cream has something to do with the voluptuous heaps of flavors artfully molded into a beehive shape and sprinkled in fresh berries and fruits. It’s like Christmas for adults – it doesn’t matter which flavor you start with, you get to try them all! 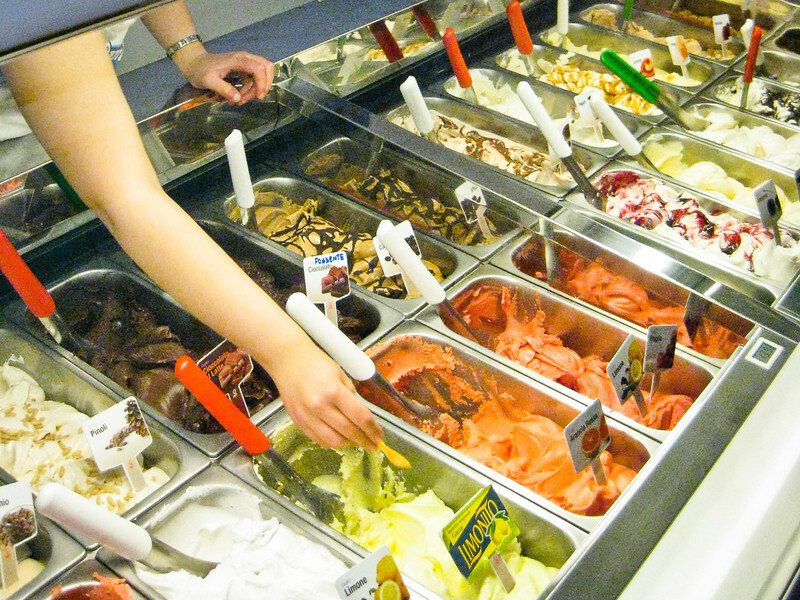 Free samples are part in parcel of the gelato experience when you’re choosing a flavor in Italy! I know it seems overwhelming, you’re thinking “Shannon, how would I ever choose with all those gleaming mounds of gently melting gelato for the choosing?” I get it; I’m the type of person who can stand in Baskin Robins for 25 minutes pondering the best choice, but take heart because in Italy sampling is permitted and even encouraged! 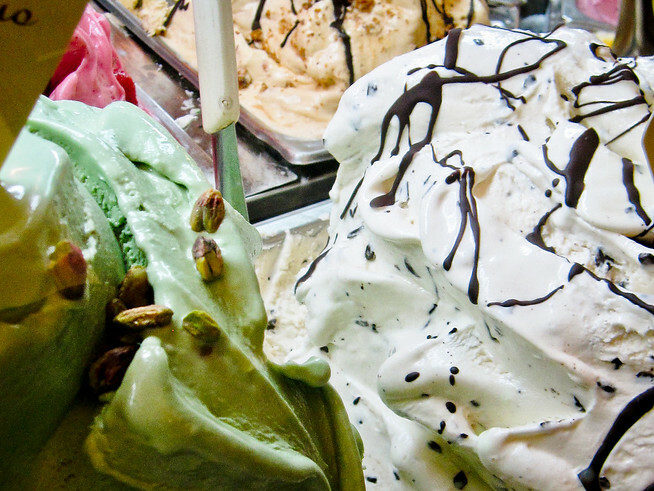 Pistachio and stracciatella gelato in artful mounds of deliciousness! My standby gelato flavor is pistacchio, and limone and stracciatella (thinly shaved chocolate in vanilla ice cream) come in as a close seconds and handy backups. One of those three are always the first flavor of the day when I’m traveling through Italy, and then from there it’s a real struggle to branch out! On my last trip to Italy, during my RTW, I made it a point to try a new flavor lining the glass cases for my second (and sometimes third) daily gelato. A ridiculously overpriced $13 gelato in Florence, Italy…buying one that pricey and large was an accident! One upside to gelato? It’s often served in small scoops and cones, so you’re not really eating that much. The downside? What you are eating is incredibly bad for you – half the butterfat/cream compared to traditional US ice cream but nearly double the sugar content…. Which is why it’s probably a good thing I can only ever afford to visit Italy for a week or two at a time! 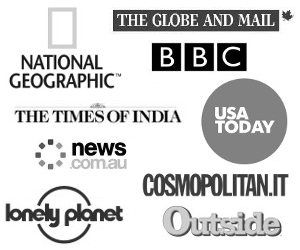 A Little Announcement…My Niece is Coming to Thailand with Me! My favourite gelato was the one I had in Rome, with lemon flavor. I had my my first gelato in Milan, inside Galleria Vittorio Emanuele. It was mango flavored. I don’t if it’s because it was the first I tasted, but it was the best of all I tried in Italy. Believe me, I tried a lot while I was there. Hehe, that first taste is hard to forget…and you may be on to something because I do think pistachio was the first one I tried and it’s my forever favorite flavor :) I’ll have to hunt down a gelateria inside the Galleria next time I’m there! I’ve been to Italy only once in the dead of winter and had an 8 euro (!!) gelato in Florence. Totally worth it. But looking back, I can’t believe I was in Italy for a week and ate it once…I was obviously young and insane. 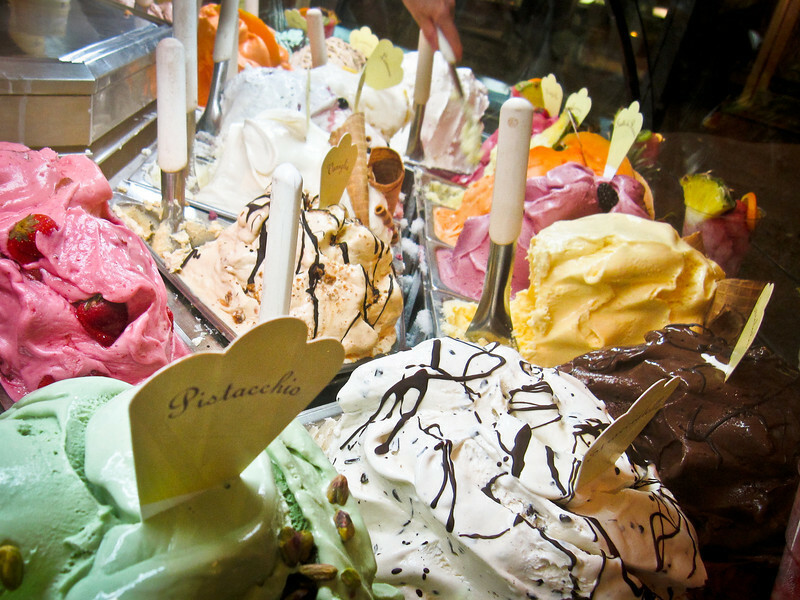 Our mouths are watering seeing all these pictures of delicious gelato! I think we have to head back to Italy :) A daily gelato was a MUST while we were there, and I think we had the best one in Lucca. Love pistacchio and stracciatella. I thought you might sympathize with the gelato love Jess! And good tip on the gelato…they make the big mounds oh-so-pretty, but a fresh one beats out a pretty one any day :) I’m wracking my brain for the name of the expensive gelato shop, but it was just a random spot walking through the city…I wanted to kick something when the total came to like 9 Euro! Shannon, you mentioned that Italy was one of your favourite countries because of the food. Haha, wow, Jess certainly seems to have a passion for Italian food! Great place to start. Me so hungy just reading the material. Thanks for the recommendations, Shannon. :) Tyler, with a month, you might consider trying a few different cooking courses in different parts of the country – food in Italy is quite regional, so you’d learn to make very different things depending on where you were. 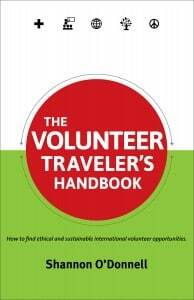 You could do a week each in a few different cities, for instance. I see. I’l consider breaking it out like that. Confession time. In 2008 I was in Rome. And then in the Abruzzo region, and then back in Rome again. And in all that time? Each time (and there were a number of times), the reason for not going in the shop was that I was hurrying somewhere else. I did the classic “try to cram things in” thing, to see how it felt. And I hated it. I’m a stroller, not a hurrier. And so a casualty of that was gelato (but thankfully not pizza – I wasn’t quite *that* stupid)…. You gave an explanation like there is *any* acceptable reason to have not tried gelato when you were there. 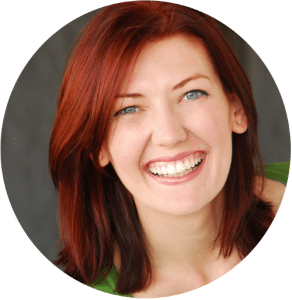 I’m with Shannon on the stern head-shake. Not acceptable. I’m confused as to this “limit” of two gelato breaks per day. This does not compute at ALL. One of my favorite memories from my first trip to Italy with friends at 18 was on a hot, sticky day at the Colusseum. We had headed in early to beat the crowds, but after wandering around, we were already dripping in sweat–it was July–and as we wandered out, we saw a gelato cart. My fellow gelato-obsessed friend and I looked at each other–said why not–got a cone–and then looked at our watches–it was only 9am! Best start to a sightseeing morning! Love the title & so true! We definitely overdosed on our travels through Italy, even though it was freezing outside. I would always get Pistachio and Hazelnut…YUM! Eating gelato in the winter is just one of those sacrifices you have to make ;-) I’ve only ever visited in the summer, but like you, I think I’d still have to get some! I have tried Gelato a lot of places outside of Italy and have always been disappointed. Even in other European Countries, it just doesn’t add up. 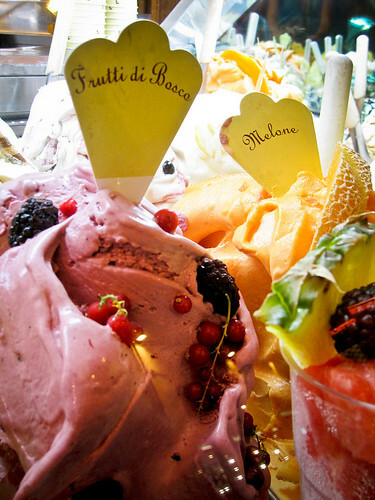 Oooh, it’s never a bad time to talk gelato! Simon is ridiculously conservative and always goes for chocolate (he knows what he likes) while I attempt to try a different flavour every time. They are all so good. Nowhere beats Italy for gelato of course, but we did just discover a great ice cream place around the corner from us in Kyoto -surprisingly good but rather dangerous for our budget at $4.50 a pop. Couldn’t agree more! I feel the way Simon does about mint chocolate chip ice cream when I am in the States…but gelato, it’s fair game of every flavor. 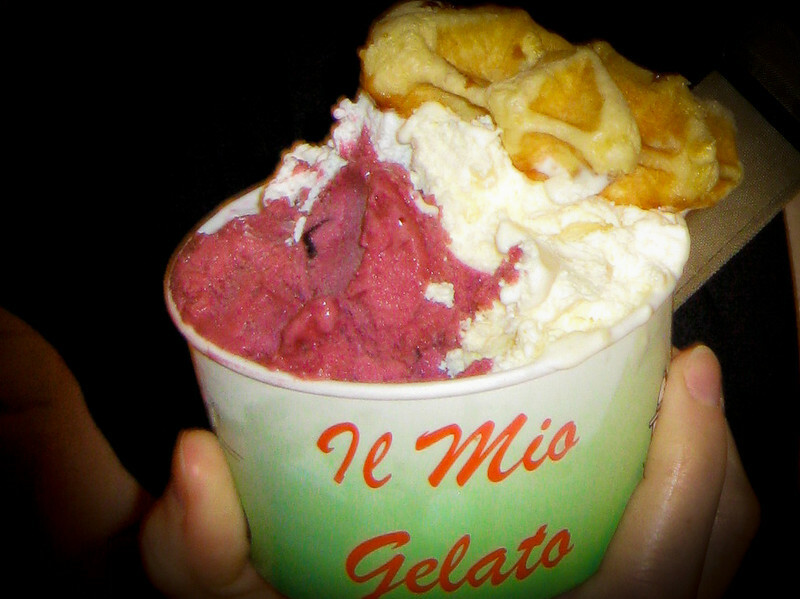 As for the gelato shop in Kyoto…4.50 is a bit dear for the budget, yikes! I have a fear of traveling through Japan because it seems it’s true that it’s really pricey!